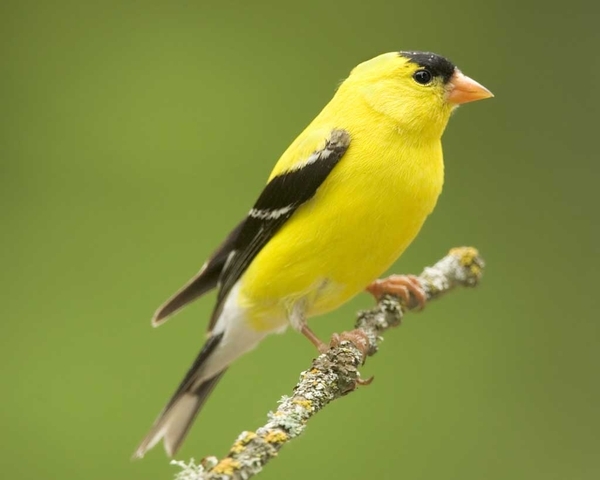 Saw the first goldfinch of the season yesterday. Mid summer they (at least the males) are a glorious shade of bright yellow. This one didn’t have on his summer coat yet. In fact, I would have mistaken him for a sparrow had it not been for the bright streak of yellow, hidden under his tail feathers at the base of his back. I’ll bet he didn’t even know it was there. I wonder if he even had any idea that the change had begun. Probably not even aware that soon he will be a brilliant golden glow. Nope. For now he is just the same as he has been, all winter long. But I saw it. I saw the marking, the beginning of the beauty. And celebrated the first goldfinch and the coming of spring. Then I got to wondering about the beauty in us. And whether we see it, or whether it begins as just a mark, perhaps hidden under our tail feathers, that other people may notice, but not us. A patch of brilliance on our behinds, in a place we can’t see. God would know that is the place to begin because otherwise we might get all pleased with ourselves. Go strutting about showing everyone that we were marked, we were selected, we were chosen to be beautiful. And, if we were some of the early ones, we might carry on like this for a while. Everyone else thinking they are less beautiful or not chosen or unmarked by the hand of beauty. And not caring much at all for us. 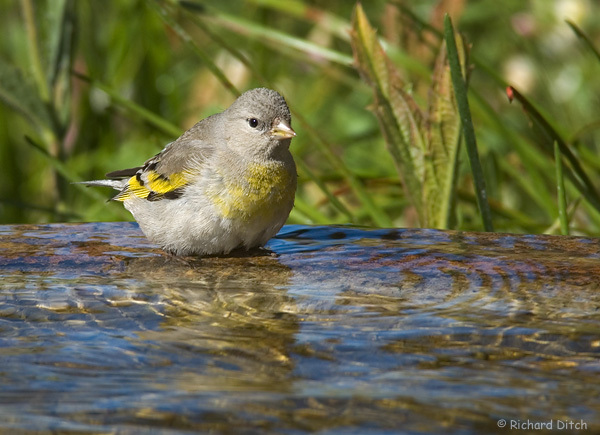 those female goldfinches, in their shades of lemony green, are attracted by that beautiful yellow coat of feathers. And that strutting serves a purpose. Just as the bright yellow does. To attract, to court and to bind together. The hand of beauty does that. Plants beauty that is both wonderful to behold and useful for His purposes. I think he was quite well liked by the college co-eds. But his point was made. Males of the non-human species according to Dr. Wiseman are fashioned more beautifully. They sport the brighter colors so they will attract attention, not only of potential mates but also of potential predators and thus draw it away from the females of the species. So wise. So effective. So purposeful. And so to my dear friend the goldfinch I whisper, “Be wary of the hawk that hunts in the neighborhood.” For beauty serves the food chain as well as the perpetuating of species. Maybe that’s why it begins so small and in a place unnoticed. So in the time it takes to grow to full plumage the one who wears it can learn to wear it well. A season at a time. Imagine, to be marked by such beauty and not even know it. The anatomy and physiology book from which I used to teach college students states, “Biologists have found that all living things share certain basic characteristics, including the following (in this order): responsiveness, growth and differentiation, reproduction, movement (internal or external), metabolism and excretion. By internal movement, they mean the movement of things inside the organism. By external movement, they mean that the organism moves its whole self through its environment. Another thing is when I am faced with indecision and at a standstill – still, especially stalled, not good for me, remember? – I lift the options in my mind (one might call it prayer) and find myself moving toward one option and away from the other. I haven’t made this decision consciously, but it’s been made. Then I proceed, slowly at first, until the Spirit confirms the direction by picking up steam. What is Spirit steam? It’s an “aha, now I see it” or a “that’s just what I meant to say and now I see how to write it” or perhaps it is another person who offers verbal confirmation. Of course I have learned the hard way that one must always be looking for stop signs and yield signs along this way, too. The sort of “you’ve gotten this wrong” or “I’ve changed my mind” indicator moments. Does God change his mind? I’m not sure. Usually I presume it’s me and not God who has re-routed, but I have learned that even the time headed down the “wrong path,” is redeemable. Something here is to be avoided or something here is to be learned. Perhaps next time I will need it. Perhaps next time I will heed it and it will keep me from veering off course. But enough about the external movement, it’s the internal movement that really piques my interest. Not the motion of fluids or heart or lungs, all good, but the internal sensor of external movement. THAT speaks to me of God, sort of a God implanted GPS chip. Let’s chat about that tomorrow.